There are many opportunities in the next couple of months to taste and learn. February has a plethora of Red Wine and Chocolate events around the state. These tastings lead into March designated as Washington Wine Month and culminating in the grandest grand tasting of Washington wines in the nation. But first, one of my favorite listen, taste and learn events is the Belgian Beer Fest organized by the Washington Beer Commission. The 9th Annual Festival will take place this year at the Seattle Center’s Fisher Pavilion where there will be over 100 Belgian Beer styles crafted by Washington breweries. Belgian beers are unique in the beer world. This amazing beer region has a myriad of styles including Saisons, Wits, Lambics, Dubbels, Tripels and Abbeys. Many are made with wild yeast, fresh fruit and aged hops. Traditional brewing methods blending new with aged and aging in neutral oak for a couple of years. Way before bourbon barrel aged stouts, Oud Bruins (old brown) were aged and blended old with new. They tend, in my opinion to be more wine like than beer like. For years, I could convert a wine only aficionado or at least have them concede that a Belgian Lambic was almost as good as a sparkling wine. 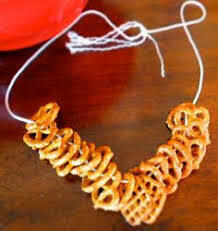 This is truly a new adventure for IPA fans but you could still sport the standard beer fest accessory – a pretzel necklace. The event is Saturday, January 27th, at the Fisher Pavilion in the Seattle Center. There are two sessions, the first from 12-4pm and the second from 5:30-9:30 pm. Tickets are $37 in advance or $45 at the door. But you take your chances at the door where limited tickets are available. The later session always sells out. Next on the fun and exciting things to do calendar is Wine on the Rock. Wine on the Rock is a two-day wine and chocolate affair held at each of the seven Bainbridge wineries. 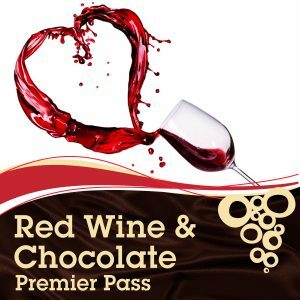 This year, Amelia Wynn, Bainbridge Vineyards, Eagle Harbor Wine, Eleven Winery, Fletcher Bay Winery, Perennial Winery and Rolling Bay Winery will pour their wines and serve up tasty tidbits of chocolate, February 10 and 11, from noon until 5p. And if you want to venture a little further afield, there is a Red Wine, Cider & Chocolate tour on the Olympic Peninsula February 10th and 11th, and 17th and 18th from 11:00am to 5:00pm. Tickets include wine glass, wine tasting and chocolate samples at all nine OPW Wineries & Cideries. Online tickets are $40 and remaining tickets will be sold for $45 at participating wineries, on a first come basis. A $10 wine tasting fee will be charged at each winery for non-ticketed visitors. 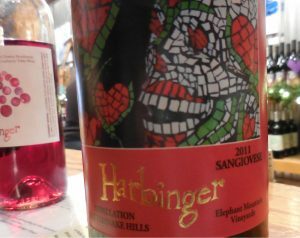 Beginning in Port Angeles, you’ll find award winning wines at Camaraderie, located at 334 Benson Road and check out one of my favorite Washington wineries, Harbinger on the west side of Port Angeles. They serve up award winning wines, local beers on tap, and handmade chocolates every day. Founded in 1979, Olympic Cellars was Washington’s 15th bonded winery. It was founded by Gene Neuharth who planted an experimental vineyard next to his winery in Sequim. The vineyard and winery were later relocated to Port Angeles in a 100+ historic barn. Their Dungeness Series is a nod to Neuharth and the winery’s first name. They also produce Working Girl wines, a nod to the three women who work hard at this award winning winery. Around Port Townsend, FairWinds Winery will be pouring tastes of Lemberger and other hearty reds. They are the only winery in the state that I know of that produces a little known white grape called Aligote’, a native of Burgundy. Other rare finds are the Fireweed Mead and the Port O’Call, a wine made for chocolate. Eaglemount Wine and Cider has moved to Port Townsend at 1893 South Jacob Miller Road. The new digs have plenty of room for dinners, dances and receptions and a guest house. In 2006, Eaglemount started making ciders from over 30 varieties of heirloom apples on their 1883 homestead orchard. Grapes for their red wines are sourced from eastern Washington and processed at the winery. Their red wines and hard ciders have won double gold, gold, silver and bronze medal at numerous competitions. The main focus at Wind Rose Cellars is Italian varieties, primarily Dolcetto, Barbera, Nebbiolo, Primitivo, Pinot Grigio, Sangiovese and Orange Muscat. Orange Muscat is definitely a chocolate match even if it’s not red. The oldest AVA in Washington state also has the oldest running Red Wine and Chocolate event. 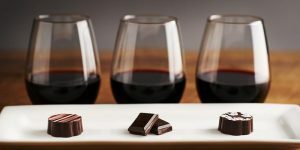 The weekend of February 17th and 18th over 40 wineries in the Yakima Valley AVA will be pouring tastes of fine wines and nibbling on decadent chocolates from 10:00am until 5:00pm. And finally, Taste Washington is the most decadent of wine events. Exclusive pours from world-class vintners, gourmet bites from great restaurants and private food and farm tours are events you don’t want to miss.